Shri Frazer Heights is a residential project developed by Shri Infratech. The project offers very well designed residential 2BHK and 3BHK apartments. The project is well connected by various modes of transportation. The site is in close proximity to various civic utilities. In which area is Shri Frazer Heights located?The project is situated in Naini, Allahabad. What apartment sizes are available in Shri Frazer Heights? The project offers apartments sized between 1010.0 sqft and 1295.0 sqft. What is size of 2 bhk in Shri Frazer Heights? 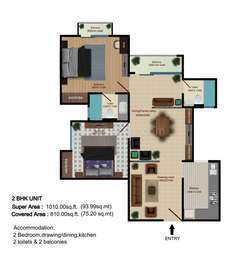 The area of 2 BHK apartments is 1010.0 sqft. What is the area of 3 bhk in Shri Frazer Heights? Three-room units (3BHK) in the project are available in an area of 1295.0 sqft. How much is the actual area of Shri Frazer Heights?The area of the project is 5.0 Acres. What is the price of 2 bhk in Shri Frazer Heights? 2 BHK units in the project are available at a price tag of Rs. 3100000.
how much time to go to start the project !.